Paper invoices often get lost or misplaced, cause needless clutter, and waste time for your service technicians who must drive out of their route to turn in completed work orders. Learn how Smart Service HVAC invoice software can help streamline your business by generating digital work orders accessible via mobile phone or tablet, allowing your service techs to complete them while out on the job. Finish crucial paperwork in a snap. When paired with our mobile app iFleet, Smart Service hvac software provides a comprehensive invoice software solution for your service business that will save you both time and money. A robust set of features such as invoice generation, QuickBooks customer database integration, and billable hour tracking minimizes day-to-day operational inefficiencies that cut into your bottom line. Digitize your existing forms with ease and import them into the iFleet mobile app for field service to generate and fill out invoices remotely, without ever making a trip to the office. With Smart Service and iFleet, you’ll have the features you need to achieve success in the HVAC industry. With Smart Service and iFleet, your team can intake, assign, complete, and invoice jobs with ease. Take a look at some of the key features that will take your HVAC service business to the next level. Smart Service HVAC invoice software frees you from monitoring the time field service agents spend on a job. Track work orders and equipment so you can efficiently coordinate your employees and valuable assets. Instead of turning in a crumpled stack of job invoices at the end of the day, Smart Service and iFleet let your employees take care of invoicing digitally, on site. This saves time and can even free agents up to complete additional jobs. 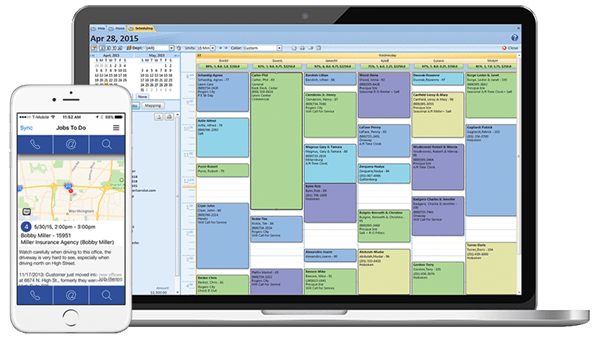 iFleet, the premier field service app for the HVAC industry, stands capable of pushing schedule updates, client information, service history, and more directly to your workers on the job, empowering your whole team to do their work effectively. Smart Service HVAC software for QuickBooks lets you integrate your existing customer database so that you have the most up-to-date information, accessible in the field via smartphone or tablet. Collect payment information, signatures, and work order notes right in the Smart Service field service app. Get rid of the time needlessly wasted driving to the office to pick up extra forms. We know that you have your own business processes and invoice forms, so Smart Service makes it easy to digitize your existing invoices. Instantly share completed paperwork with office or field personnel. When you purchase Smart Service software, you own it. Period. No ludicrous subscription fees that nickel and dime you constantly as you use the software. The amount of time and needlessly spent effort your business will save using Smart Service easily pays for itself. Already own Smart Service and want to see the powerful features of iFleet? Download a free demo on the Apple App Store or from Google Play.